Notes: The first FACT A (Factory America) release (?). 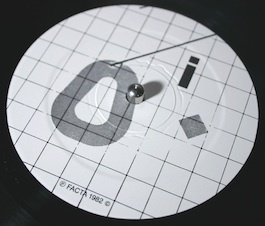 The title is 'Ike Yard'; the sleeve graphics ("A FACT A SECOND") reflect its catalogue designation: FACTA 2(nd). The album was recorded at the Ranch, NYC in May/June 1982. A re-release via Desire (dsr50LP) planned for Autumn 2012. MICHAEL SHAMBERG's cover design may have been influenced by LAWRENCE WEINER, an NYC conceptualist artist who also designed sleeves and posters for Factory.